Whether it's as reflective thermal insulation, a protective second skin against burning embers in a bushfire area or as a way to control condensation, CSR Bradford has a product solution to suit your roof type. Thermoseal Roof Tile Safety Extra Heavy Duty Reinforced polymeric lainate suitable as a secondary hail protection system and certified as a fall arrest system in accordance with AS4040.4. Good interior finish. 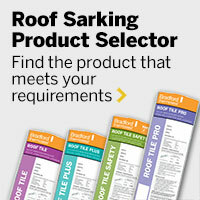 Thermoseal Roof Tile Plus Extra Heavy Duty Premium, medium weight polymeric and paper laminate contrsuction for easy laying in most conditions. Very good interior finish. Thermoseal Roof Tile Heavy Duty Economical lighter weight polymeric construction suitable for everyday use. Enviroseal ProctorWrap HTR Medium Highly permeable, high water hold-out vapour permeable roof sarking suitable for use under tiled, metal, slate and concrete roofs. Thermoseal Resiwrap Extra Heavy Duty Single sided reflective foil laminate constructed using an extra heavy duty polymeric laminate for superior strength and tear resistance. Thermoseal 733D Medium Medium duty; tough paper based single sided reflective foil lainate that provides and exceptionally smooth surface finish and excellent resistance to temperature variation. Thermoseal Roof Metal Wall Light Light duty, paper based double sided reflective foil laminate with anitglare on one side - suitable for applications where an air-gap-R-Value contribution is required from both the outward and inward facing surfaces. CSR Bradford offer a range of technical services including condensation modelling for project or climate specific applications by different construction types – advice should always be sought regarding high humidity environments such as indoor swimming pools or spas. Contact us for assistance.